Chelsea manager Maurizio Sarri stormed down the tunnel after his side’s 6-0 defeat to Manchester City without shaking Pep Guardiola’s hand. Sarri is livid with his team. Manchester City were ruthless agains the Blues today, the Citizens capitalised on almost all of their chances to hand Chelsea their biggest ever loss in the Premier League. Sergio Aguero will steal the headlines and rightfully so, the Argentinian managed to break several records today and the 30-year-old has established himself as one of the best strikers to ever grace the Premier League. 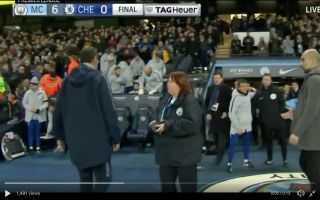 Guardiola had to settle with a post-match handshake and conversation with Chelsea’s assistant, Gianfranco Zola, after Sarri stormed down the tunnel. Sarri is regarded as a very respectful coach by his peers, so this behaviour is a bit of shock, but it is understandable after his side’s performance today.